Posture – Is there such a thing as good or bad posture? 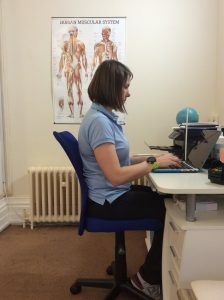 Is this such a BAD posture? Read on to find out more!. Many people I see in the clinic want to improve their posture. If I ask them to demonstrate what they think they want their posture to be like, invariably they will sit up straight pinning their shoulders back and pulling the their stomach. Is this posture any better than me sitting above in the opposite position of slumped at a desk? The simple answer is No. Posture if fundamental for efficient movement. It is not the case that we have two choices either good or bad posture. We all move through a range of body positions depending on our activities. Even when standing still and breathing the body is active and moving in subtle ways to maintain balance and control with minimal effort. If we actively try and fix our posture in the traditionial shoulders back stomach in approach we will create rigidity which prevents freedom of movement and will reduce physical performance. It will restrict our ability to breath effectively and create tension in neck, shoulders and lower back, similar to sitting in a slumped position. This upright posture is tiring and hard to sustain. After 5 minutes you resort back to sitting in a slumped position, and so the cycle of upright vs slumped begins. One of the simplest things I tell people to do is move. Sometimes we view our posture as the reason we get back pain or neck pain but actually the reason may be as simple as not moving or changing position. So simply getting up moving around and then going back to what you were doing may be all that is required. However, if you know you are going to be spending time sitting for longer periods here are some really brillian tips. Even Better is that they are easy to do and involve minimal effort and can be done in any position anywhere. First stand or sit in a relaxed position almost slumped. Now imagine a large helium balloon with a string attached to the back of the top of your head. Then visualise this large balloon gently lifting the weight of your head off your body. Imagine it lengthening the back of your neck so that your chin drops down slightly. Allow yourself to lengthen without straining. If sitting notice how the balloon takes you from the back of your sitting bones to feeling like your body is now sitting on top of the sitting bones. This should feel effortless. If you feel any tension anywhere stop let go, give yourself a little shake and switch on your balloon again. Jo Elphinston founder of JEMS explains more about ballooning in this great little video. No Tension: Ballooning involves minimal effort and, therefore, there should be no tension anywhere in the body. Breathing should feel easier . Try sitting bolt up right and take in a large breath and see what it feels like and do this again sitting slumped. Now switch on your balloon and take in a deep breath. You should notice quite a difference in how deeply you can breath. 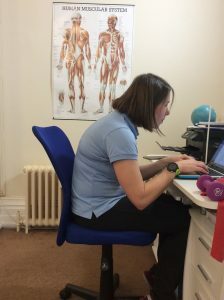 Automatic Support from the muscular system: Place one hand on your stomach when sitting slumped then notice as you switch on your balloon your stomach naturally lengthens and draw inwards. You have activated your trunk muscles by cleverly stimulating a reflex which was triggered by your head position. This is involved much less effort than actively pulling in your stomach. Relaxed Shoulders: Take a note of the difference in your shoulder position when you have your balloon on and off . Again you will feel that the shoulders and chest have opened up slightly as your balloon goes on. No fixing shoulders backwards or pulling shoulder blades back and down. Just light effortless opening. For more information feel free to contact Fiona at Bridge 38 physiotherapy . Why Everyone Should Practice Improving Their Balance.